Kebab & HotDog There are 12 products to choose from. Takeaway Lanzarote - Restaurants Puerto del Carmen Double Cheeseburger, Chips, Soft Drink. 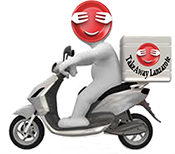 Takeaway Lanzarote - Restaurants Puerto del Carmen Pizza Puerto del Carmen- Takeaway Puerto del Carmen.